Having the right clock can make a world of difference in the life of a senior. From being able to see the numbers, to being able to determine which day of the week it is, to getting a reminder for medications or appointments, these clocks are important to help you set and maintain a daily routine. Having a daily routine is vital to healthy aging in place, so whether you are a senior yourself, or a caretaker looking for the best clocks for the elderly in your life, there is a clock option that fits the situation. We’ve looked at some of the clocks that promote being excellent options for seniors and have broken down the pros and cons of each one. You will find a selection of clocks for those hard of hearing, those who live with Dementia, and more. Review our findings below to find the best product for you. Who Should Purchase These Clocks? Easy to read with big, bold letters & numbers, this clock also provides verbal information. Great Gift- Excellent clock for those suffering from dementia Alzheimer's memory loss forgetful folks visually impaired or blindness. Battery Backup - Has a button cell battery for back up of current time and date,if the power does go out, you don't need to reset it. 100% Money Back - Within 30 days, we will refund full money to you if you are not satisfied with our clock. 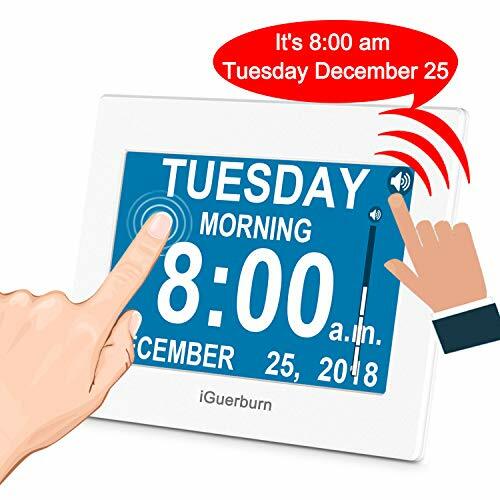 The iGuerburn Talking Day Clock is great because of its big and bold letters and numbers stating day of the week, whether it’s morning or afternoon, showing the time and date. With just a glance, seniors can feel grounded knowing the day of the week and the time. For seniors with visual impairment, this clock has a talking feature that will read the date and time aloud. There are six languages available through the talking feature including English, Spanish, and Italian. Another feature we love is the alarm system that offers multiple alarm times for reminders. This feature is key for caregivers and/or seniors who want to make sure they remember to take medication, eat at designated meal times, make it to appointments, and more. The verbal reminder can be adjusted for different days and has the option of eight reminders a day. A simple touch to the screen will turn off the alarm and the volume is easily adjustable. The clock also works as a digital photo frame, which adds a nice, familiar touch for you or your loved one, however the time and day are not displayed when in this mode. The clock is a great selection for seniors with dementia because a simple touch will provide them with the time and date as many times as requested. And the reminders let them maintain a sense of control without compromising on care. This clock provides large, easy to read numbers while offering other functions like sleep timers so you can drift off to music. The Mesqool Clock offers easy to read numbers and can also project them even larger onto any surface, like a bedroom wall or even the ceiling. All you do is point the projector, and the readout of the clock is big and bold. 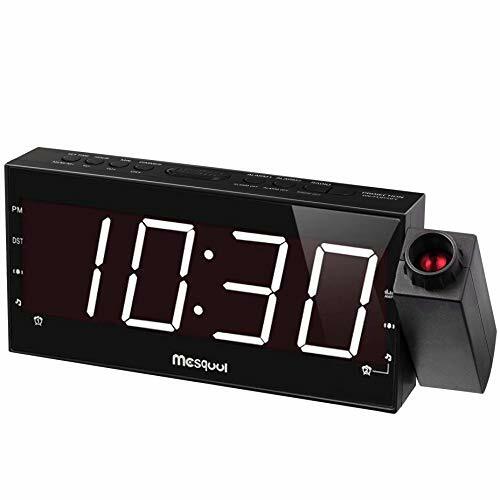 We choose the Mesqool Clock as one of our clock picks for seniors because it takes into consideration diminishing eyesight and visual impairment and as such offers adjustable brightness as well as sharp clarity (in addition to the big and bold and projection option). A focus ring on the top allows for a crisp display while a dimmer button allows you to change brightness at any time—full brightness and crisp detail during the day, and dim it to a suitable level at night while asleep. The projection even makes it easier to read the time without glasses. For seniors who like being able to tell the time when they first wake up, this is an excellent option. Another great feature is the automatic sleep timer with multiple time settings so they can fall asleep to the radio. The clock plugs in, but batteries can be used as a backup, so the clock doesn’t require a reset in the case of a power outage. There is also a USB port on the clock to charge phones. The Sonic Alert Clock provides seniors an extra loud alarm that can combine with a bed shaker. The buzzer feature has adjustable levels of different volumes from low to high pitches, which is extremely important for those with progressive hearing loss. Which is why, coupled with the bed shaker, the Sonic Alert Clock made our top pick list. The bed shaker only has one vibration setting, but does a very good job waking the most sound sleeper. Placing the shaker pad in different areas along the bed can change the vibration level slightly. For seniors who are ‘hard to wake’ or are completely hearing impaired, the shaker is a definite advantage to have in a clock. Another helpful feature is the alarm does not turn off until you turn it off, so you won’t sleep through it. A snooze option is available but will continue to go off until completely stopped. The clock face itself has large display numbers and five dimming levels so it can be easily read during the day, and the brightness can be lowered at night, so it does not prevent one from falling asleep. We especially like the shaker option, but all-in-all, the Sonic Alert Clock is an excellent clock option for those who are hearing impaired or deep sleepers. This clock offers quality radio while being simple to use and providing an easy display for the time. 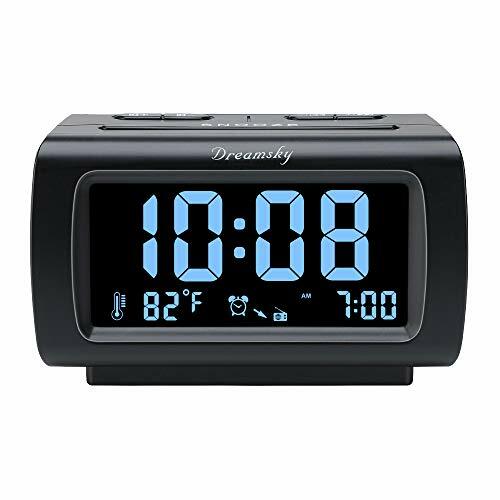 For seniors who want a compact, yet still clear and visual clock display, that also comes with a radio option, we present the DreamSky Alarm Clock. You can choose to wake up to the radio or a buzzer alarm style sound. The display brightness is adjustable as well as the volume; an added touch is that the alarm starts softer and builds to selected volume, allowing you a smooth transition from sleep to awake. 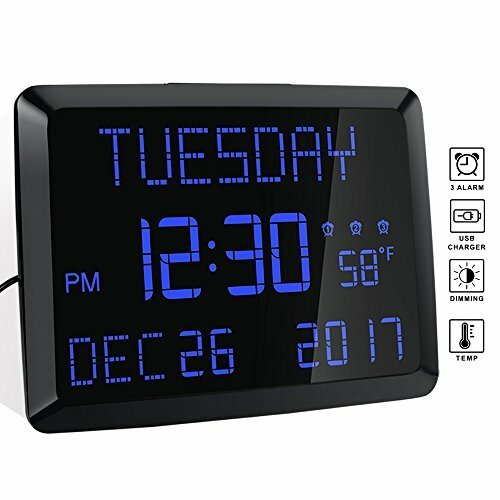 The DreamSky Alarm Clock is a simple clock with larger time display which is great for seniors who only need a little extra assistance when it comes to glancing at the clock. Time can be read without the need of glasses or squinting at the clock face. When it comes to falling asleep, the Sleep Timer offers adjustable times from 10 -to 120-minute interval options so you can listen to the radio as you drift to sleep. And the digital display is a nice shade of blue that is easy to read and calming to look at. An added feature is the display will show the current internal temperature, giving you excellent of information to start your day, plus it has an extra USB charging port. This clock gradually lightens the room to calmly wake up heavy sleepers. The hOmeLabs Sunrise Alarm Clock is another option for seniors who are heavy sleepers, but who don’t want a shrill or jarring wakening. The digital display itself, like the DreamSky Clock previously mentioned, is slightly larger than traditional clocks, handy for seniors who want to be able to glance at the clock and be able to tell the time, with or without glasses. It also features three brightness options, depending on your needs. The best part for heavy sleepers, is the hOmeLabs Sunrise Alarm Clock offers a modern, gentle way to wake up. Instead of being jarred awake in the morning, the ‘wake up sunrise’ begins to replicate an actual sunrise, starting dim and gradually growing brighter (over the course of 30 minutes). Once it reaches its most brilliant, the alarm goes off—your choice of radio, a buzzer, or nature-inspired sounds. Birds, lullabies, and ocean waves are just some of the options. You can also choose to wake to only light and no sound. We love this natural way for seniors to wake up—rather than the ‘alarm and go’ method of most traditional clocks. 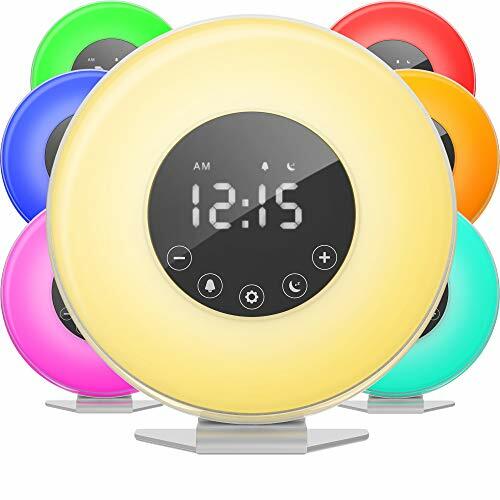 And the Sunrise Alarm Clock is fun with a variety of customizable colors that can be changed easily. The digital display can show time as 12-hours or 24-hours and is a touchscreen. Snooze option works on both the light and the alarm. As a bonus, this clock can work as a nightlight and plays FM radio. There is also a built-in USB charger to keep your phone fully charged and nearby while you sleep. This clock says the day of the week rather than the time. 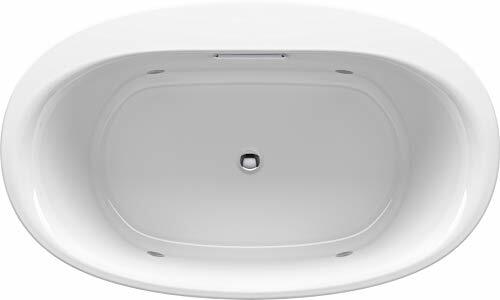 It is easy to ready and aesthetically designed. The DayClocks Classic Mahogany Clock is unique on our list for its sole purpose of displaying the day of the week. 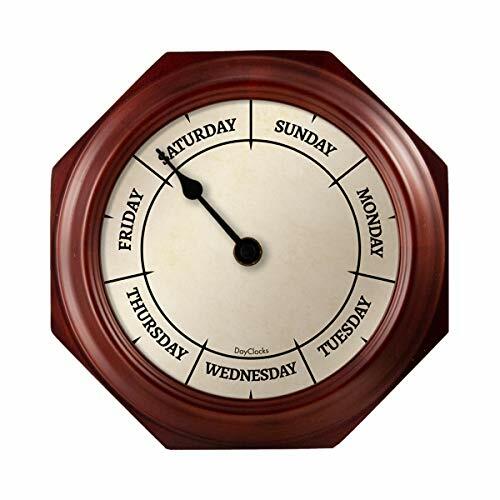 This clock is intended for seniors who suffer from Dementia or Alzheimers, or who get easily confused, and have trouble keeping track of the day of the week. Each section is divided equally into seven pieces, labeled as the seven days of the week. A hand shows what day it is as well as morning or evening depending on placement. As the hours progress, the hand moves farther along the day’s piece on the clock. A simple clock, there are many benefits to this device. For someone who is easily confused or has trouble keeping track of the day of the week this clock will allow them to know what day it is at all times. Knowing facts like that can be very empowering, and it will save caregivers time from answering the same question over and over. The DayClocks Classic Mahogany Clock is intended to be elegant and is both functional and a great addition as décor with its mahogany wood and classic design. This clock doesn’t require a chord, which means it’s can be taken and used anywhere. The iCKER Jumbo Alarm Clock offers a large display with large, bold digits that is easy for seniors to see, without the aid of glasses. The time is displayed as 12-hour or 24-hour and shows day, month and temperature. The atomic feature means the time, day, and date are always accurate. The temperature can be displayed as Fahrenheit or Celsius and can also show humidity. Because it does not require a cord, it makes for an excellent desk clock or can be mounted on a wall. The thin design is lightweight and will rest easily without taking up much room. There is also an alarm feature which uses a loud beeping sound, making it an excellent clock for the heavy sleeper senior. The iCKER Jumbo Alarm Clock is a simple, large display clock and a great option to have in multiple rooms. This clock features a USB port which can be used to charge other devices. Reasons to purchase clocks for seniors can range from wanting a simple, easy to read clock that’s just a little larger than traditional clocks on the market, to having a clock that helps with reminders for medications, appointments, and the like. Having a clock that is informative and unique to your needs can improve your life. 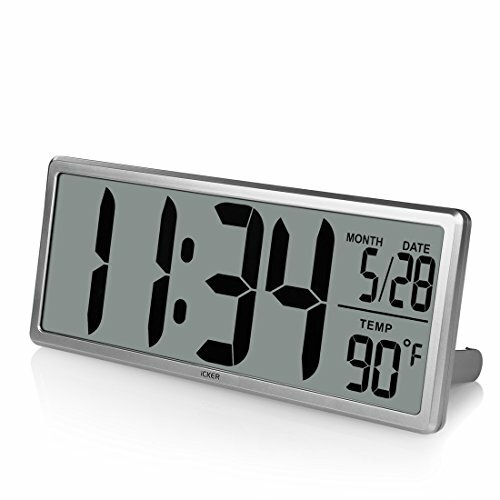 With large displays, you can read the time, and on some clock options, even the date and temperature. Setting alarms to wake up or remind you of important times allows you independence while maintaining an excellent quality of life. If you take care of an elderly individual or have a senior family member, then these clocks can be beneficial for you. Clocks with multiple alarms can be used to remind you or your loved one when to take medication or have a meal. Those who have dementia or tend to be forgetful can benefit from clocks for seniors that are designed to make life easier. If you or someone you care for is hard of hearing, then clocks designed for seniors can assist in waking up and starting the day right. Having a clock like this not only eases your worry, but also allows your loved ones to regain independence and feel comfortable in their home. Aging can be challenging when our bodies do not respond how they used to respond. Any information they can gather on their own, like knowing the date and time or providing reminders for important moments, allows the senior to retain a sense of normalcy. These types of clocks can also work for people of any age who are forgetful, busy or sound sleepers. Teenagers or even young children learning numbers and days of the week can find these clocks beneficial. Having the right tools, in this case – the perfect clock, to meet the needs of senior for basic day to day activities allows their day to proceed smoothly and gives them a further sense of independence. With the information we’ve gathered you can review different clocks for seniors and, depending on your requirements, find the best fit for your situation. Whether it’s a clock that verbally tells you the time and day, as well as your reminders, a clock that projects onto the ceiling or half the wall, or a clock whose display is just a little larger than you’re used to, there’s an option for you.